Signed lower right, Nagy Oszkár. Nagy Oszkár studied painting with Károly Ferenczy at the Academy of Fine Arts, Budapest and with István Réti, the founder of Society of Plastic Artists from Baia Mare. After his one year scholarship in Italy he returned to Baia Mare where he soon developed his artistic style. He painted mostly landscapes from Baia Mare and portraits. 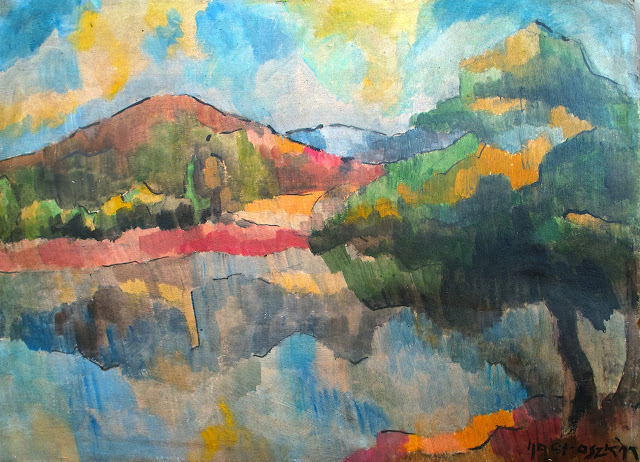 Althought unique, his art cand be traced to Paul Cézanne landscapes and German Expressionism. He exhibited in 1922 at Satu Mare, in 1936, at Carlton Hotel, Timisoara, in 1942 at University Library, Cluj-Napoca and in 1944 at Széchenyi Square Kiosk, Oradea. Nagy Oszkár founded the artists colony in Baia Sprie (Felsőbánya) which was intended to be the rival of the Baia Mare (Nagybánya) colony. Due to the facts that he worked remote in Baia Mare, Baia Sprie and never exhibited his paintings in major cities he unfortunately did not achieved a fame in Europe.